When Jack Gartner was being interviewed, he commented, “As you get older, it’s easier to walk away from work...but then, there is the commitment to a successful concept, one that allows people to continue with the learning process.” That statement really says a lot about his life, his career, and his volunteering with OLLI: the urge to work at a job to get it done well. Until his retirement to North Carolina, Jack was a complete New Yorker. He grew up in Queens, got his undergraduate degree in history from Queens College, and attended MBA classes at St. John’s University. He was recruited into his first job as a management trainee by the Port Authority of New York and New Jersey. 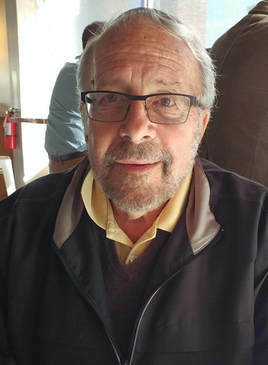 After a few stints working at the Lincoln Tunnel and in administration, he went to work at Idlewild Airport (now JFK)—then happily settled into Aviation. When he retired from the Port Authority, after 35 years, he was the Aviation Deputy Director overseeing Operations, Maintenance, and Security at four airports: JFK, LaGuardia, Newark, and Teterboro. Jack shares some of his range of experiences with his OLLI classes on airports, from dealing with snow removal to wildlife control to airport emergency response. He says that he has had to deal with the arrivals of armed military planes and high-security visitors like Yasser Arafat and Fidel Castro, not to mention 12 “runway excursions” (aka “crashes”). Now retired, he still does work on occasion as an aviation consultant and keeps his ties with aviation experts that he brings into his OLLI classes. Aviation has been a big factor in his life, since he laughs about meeting his wife Rita, another college student, on a plane returning from a vacation in Florida; she was a travel agent for many years. His daughter worked for TWA and PanAm as well. Then his son broke the pattern, coming to Duke for an undergraduate degree and UNC for a medical degree. That was a lucky break for OLLI, because in his visits to his son, Jack learned to enjoy North Carolina—especially attractive was the fact that he could play tennis and golf year-round, as was the Duke Institute for Learning in Retirement (DILR). He taught his first OLLI course 15 years ago, then was recruited by George Nelson to the Curriculum Committee to chair the “Lifestyles” section. His success there lead him to four years on the OLLI Board—as Vice-President, President, and Past President. Recently, he has served on the Strategic Planning Committee, and he has continued as a very popular OLLI instructor. His ability to get things done is remarkable: it was Jack’s connections with the NC Symphony that enabled OLLI to bring in Grant Llewellyn as the keynote speaker at the September 40th Convocation event. How did he get into volunteering? “It was almost like happenstance,” he admits; “once I got involved in OLLI as a student, once I got into being an instructor and enjoying that so much...” He pauses: “When you volunteer for any non-profit, especially one that has been so successful, it creates a real commitment to the organization.” He believes that those people whose only involvement with OLLI is participating in classes are missing a real opportunity for involvement, especially in an organization celebrating its 40th anniversary and going strong.